Any building not set on the proper foundation is sure to see its demise in a short time. The proper foundation for a house, business, hospital, or skyscraper is essential for the building staying upright and functional for a lifetime. In places plagued with earthquakes, the proper foundation is even more important, since at any time, buildings, bridges, highways, and other infrastructure need to withstand the forces of nature. We believe, teach, and practice that God, our heavenly Father, created the world in six days and that He sustains it. We believe, teach, and practice that God created Adam and Eve, the first humans on this Earth and that He is the author of all life. We believe, teach, and practice the sanctity of life, and that no one is to take the life of another human. We believe that life begins at conception and that the taking of an unborn’s life is murder, as is the euthanasia of any person. We believe, teach, and practice that marriage is the union of one man and one woman. We believe, teach, and practice that all humans are born sinful and that the only way to eternal life and heaven is faith and trust in Jesus Christ, who suffered, died, and rose again to save us from our sins. We believe, teach, and practice that people have the right, and ought to practice their faith in their everyday life. For over 100 years, St. James Lutheran Church and School has been a part of the Howard Lake community “Equipping and Empowering Families and Students through Christ.” The school provides an education that nourishes and enriches students academically, spiritually, physically, and emotionally. The school introduces or reinforces Christian beliefs as taught in the student’s home and church. It is always our goal to provide a quality Christian education in a caring, safe, and secure environment where our students can learn to the full extent of their God-given abilities. More than 80 students in preschool through grade eight attend St. James Lutheran School. Recently, St. James earned Accreditation through National Lutheran School Accreditation National recognized accrediting body. A traditional, self-contained classroom setting is used for preschool and kindergarten, while grades one/two and three/four are combined with one certified instructional teacher and teacher-aide giving assistance. Fifth through eighth grades operate within a depart-mentalized setting. Grades five and six share a homeroom, as do grades seven and eight. Students of various denominations or some with no church home make up the student body at St. James. 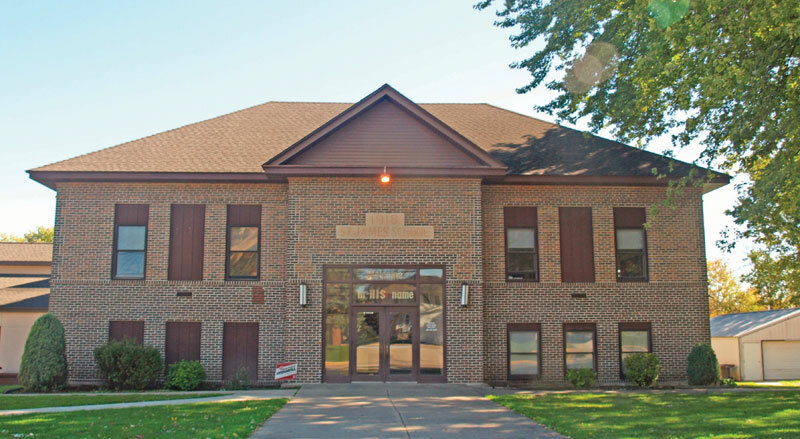 The communities of Howard Lake, Cokato, Montrose, Waverly, Winsted, and the surrounding rural area are represented in the student enrollment, with some of the faculty also coming from outside the Howard Lake community. The curriculum covers the core subjects of math, reading, English, literature and writing, spelling, science, social studies, music, band for grades five to eight, and physical education. Religious instruction occurs at all grade levels, and all subject matter is taught with Jesus Christ as the foundation or basis – our rock. Students in grades one through four are tested yearly using the Iowa Test of Basic Skills, and grades five through eight are tested three times using STARS. Test results consistently place St. James in the upper percentile nationwide. St. James employs six full-time and three part-time licensed teachers, plus one resource aide who provide remedial instruction and work with individual students and small groups. Additionally, parents, grandparents, and friends of the school volunteer, helping with the library, coaching, refereeing, providing transportation to and from games, listening to students read, serving as field trip chaperones, and helping with school programs. Extracurricular activities include piano lessons, spelling contests, science and social studies fairs, the interscholastic sports of volleyball and basketball, and field trips throughout the school year. St. James has great facilities and equipment, including a full-sized gymnasium, an updated computer lab and library, Chromebooks, interactive smartboards, and a kitchen that serves “home-cooked” meals through the hot lunch program. One special event that occurs weekly is chapel – a worship experience for students in kindergarten through grade eight. The service, which includes the reading of God’s Word, singing, prayers, and the involvement of all attending, is led by the pastor of St. James Lutheran Church, the Reverend Mark Loder, and Vicar Timothy Bayer, or by the pastor of another Lutheran Church – Missouri Synod. The students are divided into chapel “families,” and sit with their “family” each chapel service. These “families” also engage in non-curricular activities those Wednesdays when there is a two-hour late start. Another aspect of the weekly chapel is that students bring monetary offerings that are then given to non-profit charities. The non-profit picked for 2018-19 is Lutherans in Africa. The Parent Teacher League (PTL) is an organizational entity of the school, under the auspices of the Board of Christian Education, that promotes and supports the school through a variety of activities and fundraisers, including the annual Walk-a-Thon and the Gala. New for St. James is a childcare day service for preschool children. After the preschool session, students transition into childcare services up until 5 p.m. on all weekdays. St. James Lutheran School is located at 1000 Sixth Avenue, Howard Lake, MN 55349. Contact Principal Jason Roslansky at jroslansky@stjameshl.org, or the school office at 320-543-2630 to learn more about St. James Lutheran, or email school@stjameshl.org.